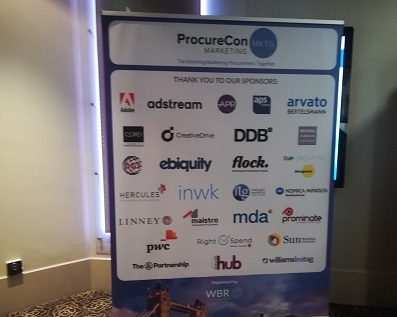 You may have seen my colleague Nancy Clinton’s report on day 1 of last week's ProcureCon Marketing event – today we have an overview of some of the key points from day 2, which I attended. It felt like there were more sponsors than ever before, which is good for ProcureCon, although the organisers need to be careful about the balance of the agenda. It mustn't become driven by the need to put sponsors on stage, and we picked up a few delegate comments about wanting more “procurement-focused” case-studies and education, and perhaps a little less from the agency side. But with around 250 delegates, this was another successful day, the morning chaired and kicked off by the legendary Tina Fegent. She said that for the first time in many years, she couldn’t find any recent bad press to quote about marketing services procurement! Perhaps we have hit a turning point, with greater collaboration between procurement, our marketing colleagues and the supply side? So one key topic for the event was “building a new agency model” – more client-centric, agile, having access to the right talent to meet clients' needs. And the work that procurement has done for years is now centre stage – focusing on supply chain transparency and of course the need for marketing services providers to really deliver. Apparently there are “14 different agency models”, and many different commercial models. Procurement needs to look at make-versus-buy decisions, and use technology effectively. We need to be professional and get professionally qualified. “Toot your own horn – and communicate the procurement value proposition”. We then had a panel discussion with Stephanie Bell of Diageo, Jo Smallbone of Vodafone, and event regular, Thomas Holzapfel, ex Deutsche Telekom and now sourcing director at “HERE Technologies”. (Yes, I had to look that firm up too). Everything has to lead to ROI, and data is key, was the message. There was talk of an in-house econometric tool (from Diageo, I think) to identify return on marketing items and campaigns, short- and long-term ROI. Marketers need to be able to validate budgets and spend, but we should also connect marketing spend to other parts of business – contact centres, customer elements etc. Our role in procurement is in helping to support the business in demonstrating value (shouldn’t we be challenging that at times as well)? Procurement is still often measured on savings, but that is changing with value and effectiveness becoming key. And we need to own / control our data, but work with the agencies and have a genuine two-way conversation. Procurement can also play a role in bringing together different parts of the business - understanding how different KPIs come together, also making sure there is one set of data across the business. We are seeing a more fact-based discussion. More planning is moving in house (rather than being with agencies). CEO, even main boards, are asking about how money is spent, returns on campaigns – there is an acceptance that there is still an element of “art” and emotion in marketing but it must be underpinned by real analysis behind the decisions. This is not about procurement owning the analysis any more – marketing is taking ownership of the data, the analysis, the value and return. Another panel was led by Johnny Hornby of “The & Partnership”. Whilst this was a bit of a sales pitch at times, the firm has genuinely interesting model – it brings together different marketing and media skills, and builds what is in effect a bespoke agency internally in the client’s firm (and in the client’s offices). News UK, RBS, and Toyota featured on the panel – so this is obviously getting traction with some major firms. David Wheldon from RBS is also currently President of the World Federation of Advertisers and he talked very directly about the ongoing issues around the transparency of digital supply chain – “$100 goes in but only $28 value comes out”. Consumers are signing up to ad blocking, there is a duopoly (Google and Facebook) that is not acting responsibly, YouTube has seen very unsuitable videos being played next to big brand adverts, and it all needs change! I would have liked to hear more from him. So, some good and interesting sessions – we also had an excellent presentation from Oliver Yonchev of Social Chain, and we'll have much more on that in another post to follow.